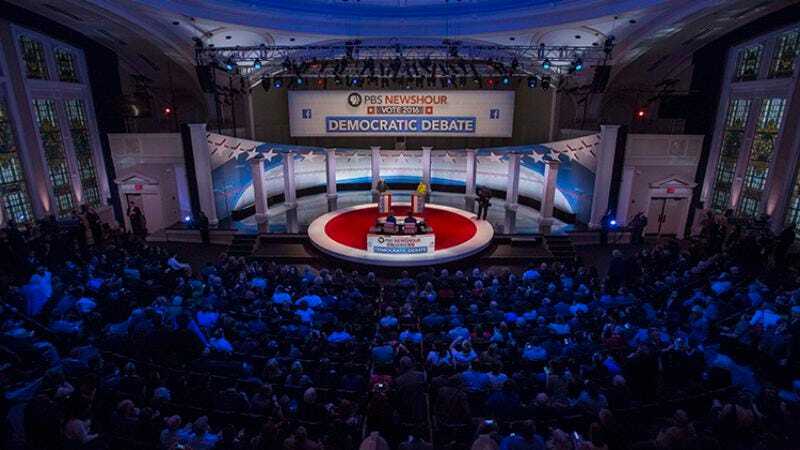 What’s it like to host a presidential candidate debate? In Expert Witness, The A.V. Club speaks with entertainment insiders to shed light on how the pop-culture sausage gets made. On February 11, Democratic Party presidential candidates Bernie Sanders and Hillary Clinton debated at the University Of Wisconsin-Milwaukee’s Zelazo Center, where the media coverage focused on their policy positions and ideas, rather than how far away the women’s bathroom was or poor stage direction leading to messy entrances. That’s thanks to Zelazo’s Director Of Facilities Randy Trumbull-Holper and Operations Manager Lisa Dickson, who worked for weeks with their team in Milwaukee to ensure everything went smoothly, from working with Secret Service to planning for the worst come show time. They spoke with The A.V. Club the day after the debate about what advice they’d give to future debate hosts, a note from Hillary Clinton, and how to move a costly 400-pound five-octave marimba out of a secured area. The A.V. Club: How did it come about that the debate was held at the Zelazo Center at UW-Milwaukee? Randy Trumbull-Holper: PBS approached us around late October. They knew they had a democratic debate—obviously at that time we had no idea how many candidates there’d be—but they looked at the Student Union as a possibility, they looked at the [basketball stadium at] Panther Arena as a possibility, and then Zelazo. And then they also went to Marquette [University] and looked at a theater there, and they looked at the Milwaukee Art Museum. So that was the first discussion. And then in November they had narrowed it to us or Marquette. And I think sometime in late December, early January, we found out that we were the site. But it wasn’t confirmed I think until mid- to late-January. They picked Zelazo specifically because they felt that the arena was too vast for what they were trying to do, and they felt that Student Union spaces were great, but they didn’t have the character they were really looking to bring into this debate in terms of the set. With Zelazo there are these columns and architecture that already exist in the space that they could play off in the set. And they actually did want a smaller room, because they were trying to get more of a town hall at one point. AVC: Do you know why they chose UW-Milwaukee over Marquette? RTH: I have no idea what the package was that Marquette put together in terms of pricing, etc., but I think they probably wanted—I know that some of our buildings had better infrastructure in terms of what we could bring into them for like the spin room, the media room, things like that. And I think a good media partner in [Milwaukee Public Radio] WUWM built into the deal. AVC: I’m glad it went to UWM and not Marquette. RTH: Yeah, I know. I always tell people—you’re a UWM grad so you understand this—but I always tell people that UWM has two inferiority complexes: one of them is Marquette, and the other is UW-Madison. AVC: So true. So was it a lot of work to prepare? LD: Smile and nod a lot, and get it done. RTH: Yeah, smile and nod… you know, I come from a theater background, so I’m very used to the whole idea of like, one way or another, this show is going to be on stage, so you just have to get it done. AVC: Did you get a list of the requirements from each of the campaigns? LD: Yes and no. Secret Service came in and looked at the different spaces, and where they wanted to place them… As far as requirements, a lot of that went through our external relations coordinator, and it was kind of done through a variety of different people. And the bathroom where we put her makeup room ended up being a little too cold so we had to find a space heater, so it was just little stuff like that. AVC: That would be a problem that a debate in Wisconsin has. RTH: Exactly. Unfortunately the tunnel that goes to the stage is right up against a block wall, so it’s very hard to keep that tunnel warm at all. But yes, we get a list of requirements from the campaigns, through PBS, and we do our best to fulfill those. Each of them wanted DirecTV—or cable feeds so they could watch CNN, Fox News, etc.—and then they also wanted a clean feed so they could watch the stage and what’s going on live, you know, that kind of stuff. That’s not stuff we had in place, so we worked with them to find providers of those services and that’s all reflected in their contracts. Basically they paid for it. AVC: Did they have dinner there beforehand? Maybe something Wisconsin-centric? RTH: Oh, yeah. I don’t think the debates, or the candidates, had anything Wisconsin-centric here, we really just provided tea, coffee, soda, water. We made sure to have a little UWM swag bag in there, so who knows if they’re going to be sporting UWM colors. AVC: Were you aware if either one of the campaigns had requirements different from the other campaign? RTH: For the most part they wanted the same things. But there are, in the DNC rules, requirements that each candidate be given the same thing or at least the opportunity to have the same thing. So every time the Clinton campaign would request something, you’d have to offer it to the Sanders campaign and vice-versa. That was an interesting little nuance that I learned about this whole process. AVC: Did any of that kind of stuff come up? RTH: Yeah. The Sanders campaign came at the beginning of this week and said they wanted some rooms in the Union and so we reached out—or, our external relations manager reached out to the Clinton campaign, and again, the Clinton campaign doesn’t know if they’re going to use it or not, but they went ahead and picked up the rooms just in case. AVC: What were they using the rooms in the Union for? RTH: The Sanders campaign was using it for what they call their rapid response team, which is the group that basically sits in a room, watches the debate, writes down every talking point, spinning points they can think of during it, and then the rapid response team then meets with the surrogates who are going to do the spinning, and so one of the rooms was for this rapid response team; the other room was for their surrogates. AVC: You mentioned that the Secret Service came in. Do you have any more stories about what it was like working with them? RTH: We actually ended up with a great crew of guys. LD: They were really great. LD: Yeah, they answered pretty much every question whenever we had it, if they had an answer, whatever the answer happened to be. RTH: I don’t envy them because they have a massive coordination effort between several different law enforcement agencies—it’s them, Milwaukee Police Department, Shorewood Police Department, and UWM Police Department, all coordinating to cover this. And so we had over 200 law enforcement on the ground yesterday. I’ve never been so well-protected in my life. And then we were all getting ready to leave because during the sweep no one’s allowed to be in the building, when they’re trying to sweep for… whatever. And I—so we’re getting ready to go over for lunch and they’re like, “You can’t leave, you have to be here for the sweep!” And I’m like, oh. So there was no lunch for me yesterday. LD: And both myself and the external relations coordinator were like, “All right, we’ll bring you something back from the Union,” and then they said we can’t bring back food or drinks from the Union. So poor Randy had to wait until catering was able to get him some food that had been approved to come into the building. AVC: Was it a crazy scene, outside the building on Kenwood Avenue there? Were there a bunch of black cars around the building? RTH: Well we actually shut down Kenwood completely, so from [surrounding streets] Downer through Maryland it was closed down. Which for the average Thursday at UWM felt weird because it was so quiet. No city buses, no nothing. And the entire place had bike racks [used as barricades] all the way around so you couldn’t even get close to the building until they opened it. So all that was set up around Kenwood and around the building, and to be honest the motorcade came and pulled in in the back of the building, and so I think most people weren’t even aware of them. And then you know we do a lot of events every year. [UWM’s art school] The Peck School does 350 events a year. But obviously this is a much bigger and more intense event, so the whole challenge of okay we’ve got to coat check every single person, we’ve got to get them through the mag security, you know… It was just a whole different world. AVC: What is mag security? RTH: They have to go through a mag… what do they call it? RTH: Like at the airport. LD: They pick up any sort of RF frequency. Any kind of metal had to come out. Belts could stay on, coats could stay on, but you had to walk through it and take everything out of your pockets, you know. Basically airport security. RTH: So that was a different experience. And when you’ve got people standing outside in extremely cold temperatures, waiting to get in through these metal detectors, essentially, it was just—they’re getting kind of grouchy. And so that’s where we look to our staff to kind of step up and say, “Okay, how do we get these people in the spirit of the event now, because they’ve just had a horrible time for the last 20 minutes?” But don’t get me wrong, everything went extremely smoothly and I think everyone was very happy. It’s just the reality of having two protectees in the building. AVC: Did you two get to watch the debate? LD: For a little bit. LD: “We’re going to go eat.” And they had monitors set up, so we were able to watch the live feed while we were eating. RTH: I had my wife with me—she used to work at the university and left to take another job, but she came back for this to help me out, and she had this crazy thought in her head that she wanted to leave a note for each of the candidates, that, from our 2-and-a-half-year-old son, and it basically said, “I come from a long line of progressive thinkers and do you have any advice for me in life?” or something like that. And to our surprise, Hillary did write a note and sign it for him. RTH: Yeah. And at first I was kind of like, when my wife told me she wanted to do this, I’m like, “Are you out of your mind? I’m not doing this. This is so stupid.” But you know what? It’s totally worth it now. Bernie did not [respond], but we think maybe his staff just covered it up before he had a chance to see it. That’s what we’re saying as opposed to saying he was crappy. AVC: Do you mind sharing what Hillary wrote to your son? RTH: Sure. Let me just pull up the Facebook post. My wife was so psyched by that. RTH: Yeah. So, I mean, I think that’s great because we can keep that for him as he gets older, and who knows, that might be from the president. But if there’s one thing, I would say if there’s one thing you can make sure to put in there, I told the Journal Sentinel, I told Fox6 but they wouldn’t listen: This was a huge effort that took hundreds of people to put on. So I can’t say enough about the team at UWM that really pulled this together. RTH: I just like—there was one article that came out in the Journal Sentinel and I just felt like—it sounds like I’m running the entire show, and I’m like, no, that’s not really what’s happening. LD: I saw that PBS gave UWM $50,000 to cover expenses. Did that cover everything? RTH: Yeah. We had a pretty strict change-order process in place so that, you know, there were additions, but we’re talking about a couple thousand dollars here or there that were directly related to—for example, at the last second they wanted a sign printed that said PBS NewsHour. Okay, we’ll print it, but it’s going to cost this much, and then we just passed that cost along. So yeah, it was pretty close. The estimates were pretty close. Which, if you ever see the budgets for some of the other debates they do out there in the world, it is tiny. RTH: Yeah, they actually had ginormous lights outside, lighting those up. AVC: Do you think this is going to be a good thing for UWM publicity? RTH: Yeah, I think, you know first of all, obviously UWM always loves engaging the student body in events like this on both sides of the aisle, and I can tell you—I can’t speak for the institution, that’s not me—but I know that they did reach out to the RNC as part of this, and said if you guys ever want to do a debate, we’re more than thrilled to have you here. And I think it’ll be good not only from a one-off publicity standpoint, but we know that when our team was in the NCAA basketball championship there was an uptick in inquiries about UWM. So there’s a hope that this will drive some interest in looking at UWM as a potential school, and I can tell you that just by googling UWM, University Of Wisconsin-Milwaukee, or Zelazo Center today, there’s a lot more results today than there were yesterday. AVC: In that Journal Sentinel article you mentioned there was a story about some crazy instrument you had to get out of Zelazo for security purposes that didn’t fit in an elevator. How did you guys end up figure out that puzzle? RTH: Yeah, it’s one of those things where we knew the instrument had to get across [the street to the Student Union], but I never thought to look to see if the Union had a freight elevator; I just kind of assumed they did. They don’t. And so the instrument is like 8 feet long and three or four hundred pounds, and it’s a marimba, a five-octave marimba, and so we ended up having to just carry it. Six guys, three on either side, and just hoof it up there, and actually my staff will be going over there at 4:20 this afternoon to bring it back. So next time we have to put the bands over in the Union, I will remember that. AVC: Would you do this again? RTH: Oh, yeah. Absolutely. Not tomorrow, but it’s a… I think, one thing I didn’t anticipate is Lisa and I both made some really great friends on the production side of things. The camera guys, the light and sound guys, the carpenters, I mean we just met all the people—the director, the scenic designer—that really are so unbelievably appreciative of the efforts that we put in. I think that makes us want to do it again. AVC: What advice would you give your counterpart who is doing what you did for the next debate? RTH: I think, one, know that you have to roll with the punches, and there will be lots and lots and lots of revisions. I can tell you, the floor plans—we started out with an idea of where everyone was going to be, and then Secret Service gets involved and it changes, and then the DNC gets involved and it changes again… So I think we ended up with about 13 different versions of those floor plans by the time we were done. Just being okay with the fact that things are constantly changing is important. And then I think you can’t over-plan enough. You just have to try and anticipate every possible scenario that you can be thrown, and have solutions already in mind for how you’re going to fix those. And then one thing that we did—I don’t know if it’s standard or not, but I had one person from basically every trade we have at UWM, so I had a plumber, an electrician, carpenter, an HVAC technician, we had a network engineer—all on site last night. Even though we didn’t use all of them, we used enough of them that I would absolutely recommend it. Just because it’s like, all of a sudden we had to put lights on the front of the building, and I had to figure out if we had electric capacity out there. And it got a little too hot in the hall so I’ve got my HVAC guy on his computer fixing that. Just like, “Okay, if there’s going to be a problem, who do I need to fix it?”—that kind of stuff is important. What about you, Lisa? LD: Make sure to educate your staff, because I think part of the reason that things ran as smoothly as they did is because we have a staff of 20 students here that work with us as house managers, and we set the expectations, we made sure to let them know what the day entailed, how it was going to run, when they were going to get a break… all of those different things. And I think because they were able to anticipate what was coming next, it helped it be that much more enjoyable for the patrons, and it helped take a lot of stress off of Randy and myself because Randy was busy doing things on the first floor, and I was busy doing things on the second floor. So a lot of times they just took the reins and ran with it, because they knew what our expectations were. LD: We’re hauling makeup chairs, computers, and everything. And the three of us are the only ones at the university who know the building and are able to do it. AVC: What was the weirdest part of hosting the debate? LD: Well, we’ve been doing larger and larger events lately, so—I mean, nothing on this scale, obviously—but for me the weird thing was seeing Randy on TV and seeing his name in print, because a lot of the work we do in our department is so behind the scenes that people see our name in emails but they don’t necessarily know what we look like, and so it was like, all right, Randy has to go and do an interview with Fox6, I have to go and speak with this reporter. LD: No. That was definitely weird—at least on my end. RTH: I can’t think of anything else that was really weird. It was just a—it was a very good experience for us and I think for the university. I think everyone was very happy, we had a few disgruntled musicians here and there, but overall everyone was very happy. AVC: How did the students react? Was there a lot of excitement on campus about this happening? RTH: Yeah, I mean I think there was definitely a buzz that people were going to be on campus, and, like I said, there were a few students who were upset about being displaced into a different space for the week, but the reaction that I saw from most students was, “Wow, UWM was picked for this? A national thing? This is huge!” And so I think that that really kind of was good. And Facebook was one of the sponsors and they had a big setup in the concourse of the Union, and I think that really helped make people engage with the debate a little bit more. And I’m hopeful that it at least gets people thinking about voting. Millennials have a horrible track record of voting, so, that would be a good outcome of this. Our student-body president actually got to meet the candidates, so that was pretty exciting. AVC: Were you there for that? RTH: No, they ran them in right as they arrived and got a quick photo op, and ran out. Because they arrived I think maybe 20 minutes before they went on stage. So it was pretty quick. I think it’s interesting, at that point, that’s probably the one point where you can catch the candidates where they’re not really in campaigning mode. They’re in like just in-their-head mode, thinking about what they’re going to say and all that kind of stuff. AVC: Did either of you meet the candidates? LD: I got some photos after the debate was finished from the back of the concert hall, but that’s about it. I was in the back of the hall after the debate was over, and the candidates were up on stage and doing photo ops with the people that had gone towards the stage to meet with them, you know, from the audience. So I got pictures, but not with me. RTH: I got to meet their staffers—I mean, that was nearly as cool, right? But yeah, no. And I got to meet [debate moderator] Gwen Ifill, which was really exciting. I’m a big politics nerd and always have been, so I certainly was familiar with her. AVC: Did the moderators have any special things that they needed for this? RTH: Not really. Gwen Ifill and Judy Woodruff are probably the most low-key talent I’ve ever met. All they want is a quiet space where they can think about what they’re going to say and write down notes and a little bit of water and that’s it. They were great. AVC: Anything else you want to add? RTH: We’re just ready to go home and go to sleep now.